JD Decker, administrator of the Nevada Real Estate Division, speaks to HOA board members regarding legislation. This is primarily why we felt it was important to facilitate planning sessions and a trip for board members to have their voices heard and to make a difference. 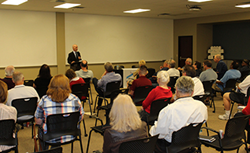 FirstService Residential, the leading community management company in Nevada, hosted a Night Out with the Real Estate Division for HOA board members on Thurs., March 3, 2016. JD Decker, administrator of the Nevada Real Estate Division, and District 9 Senator Becky Harris discussed the 2015 legislative session and the laws affecting the HOA industry. JD Decker also explained the goals of the Ombudsman’s Office regarding common-interest communities and their services. The Ombudsman’s Office handles HOA disputes through two processes – informal mediation and disciplinary investigation. The informal mediation process is typically used for situations where a board member acted with the community’s best interest in mind; however, their actions were a slight infraction of the law. Situations where board members acted in their own best interest with no regard for the community while violating the law are handled through the more formal disciplinary investigation process. Decker stated that the Ombudsman’s Office resolved 84% of submitted complaints through the informal dispute resolution process in 2015. Both speakers encouraged event attendees to get involved in the upcoming legislative session by vocalizing their views. Senator Harris gave a brief explanation of each bill from the 2015 session that effected homeowners associations, as well as her stance on them. FirstService Residential is planning to return to the Capitol again in 2017, and is hoping to bring along a larger group of board members to represent the HOA industry. FirstService Residential delivers proven solutions and exceptional service that add value, enhance lifestyles and make a difference, every day, for every resident and community it manages. FirstService Residential is a subsidiary of FirstService Corporation, a North American leader in the property services sector. For more information, visit http://www.fsresidential.com.